LEARNING CARNATIC MUSIC THROUGH WESTERN STAFF NOTATION. This Carnatic Music reader series introduces a systematic study of Carnatic Music with the help of western staff notation. The series has been designed with the beginner in mind so that he can learn to play the lessons on western instrument like guitar, piano, saxophone, violin etc. and midi instruments with minimum effort. All the exercises are presented in western staff notation, letter notation and conventional carnatic music letter notation. The series contains a basic introduction to western staff notation system. Book 1 - Fundamental lessons- Contains an Introduction to carnatic music, simple introduction to the concepts of western staff notation, Excercises for fundamental lessons starting from Saptaswara, Sarali varisa, Janta Varisa, Dattu varisa, Mandra sthayi varisa, Madhya sthayi varisa, Tara sthayi varisa, Alankaram, Gitam, Lakshana geetham, Jati swaram and swara jathi. The three part series for learning Varnam in western staff notation Adi tala and Ata tala Varnam is presented as a three part series, considering the importance of learning Varnam in western staff notation. The three part series contains extensive notation for 24 Adi tala Varnam and 10 ata tala Varnam in three parts. Book 2: Adi tala Varnam-Adi Tala Varnam -1 - 1.Ninnu kori-Mohanam, 2.Sami Ninne - Sankarabharanam, 3.Evari bodha - Abhogi, 4.Vanajakshiro - Kalyani, 5.Intha chalamu - Begada, 6.Tharuni ninnu - Kambhoji, 7.Sarasuda nine - Saveri, 8.Jalajaksha - Hamsadhvani, 9.Inthamodi - Saranga, 10. Era na Pai - Hanumathodi, 11.Ninne kori- Vasantha, 12. Sami ninne - Sree. Book -3: Adi Tala varnam -2 1.Intha chauka - Bilari, 2.Sami ninne - Panthuvarali, 3.Sarasija mukhiro - Arabi, 4.Karunimpa - Sahana, 5.Chalamela -Darbar, 6.Saraguna - Madhyamavathi, 7.Sami Dayajuda- Kedaragaula, 8.Sarasijanabha - Mayamalavagaula, 9.Entho prema - Surutti, 10.Rahamathangi- Udayaravichandrika, 11.Chalamela (Pada varnam) - Nattakurinji, 12.Rama evela - Kharaharapriya. 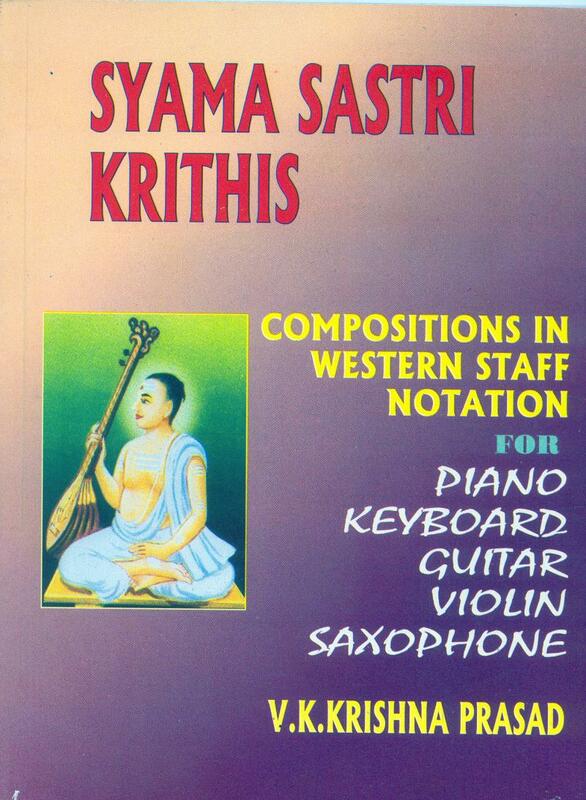 The three part series on Kritis in western staff notationcontains a selection of 45 compositions on various ragas of different composers presented in the same western staff notation supported by carnatic letter notation. The three part series contains different kritis in different talas. presented in 7 DVDs in 21 hour learning programme. Ragas in Indian Music is an exhaustive reference guide for Ragas in Indian Music. 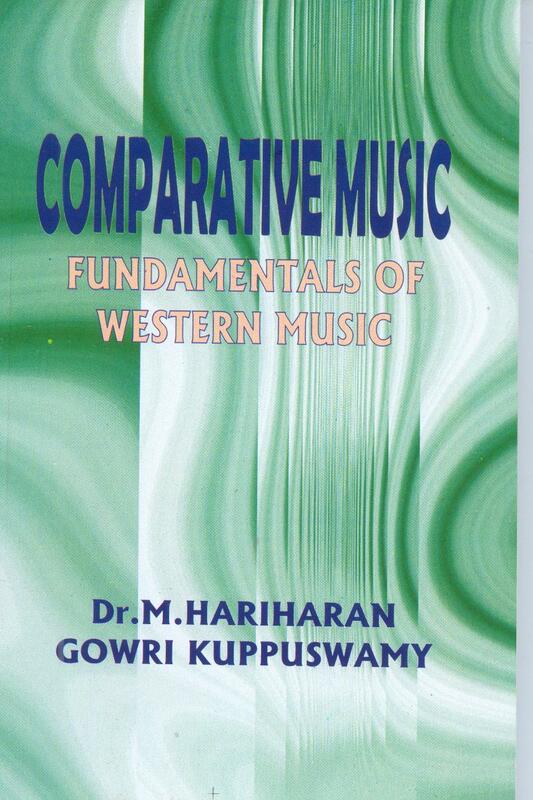 Comprehensive information and equivalent of about 1200 Ragas covering various Carnatic ragas, Hindustani Ragas, Tamil Panns, and Western Scales are included in this book. Information on Melakartha parentage, its svara notation, Equivalent Western scale, Staff Notation, The Tamil Pann relationship, Hindustani raga equivalent are some of the important information provided for each raga. Each Raga is graphically presented with synonyms, Carnatic letter notation, Staff Notation, ABC letter notation, semitone intervals, sruthi bhedam, swarasthanas, varjya swaras, raga types, Western scale types, piano rolls and much more. An exhaustive master index on ragas, index based on different classifications based on Sampoorna and Asampoorna Mela, Hindustani, Carnatic, Tamil Panns, Kathakali ragas, Western scales, etc. Makes the book a very essential tool for understanding the raga concept as prevalent today..
contains Select 30 kritis of Tygaraja, in 2 volumes suited to instrumental music have been presented in western staff Notation. These compositions are best suited for playing on Keyboard, Piano, Violin. Contains carnatic music standard notation, text of the composition, western staff notation score. Select 30 kritis of Muthuswamy Dikshitar, suited to instrumental music have been presented in western staff Notation. in two volumes These compositions are best suited for playing on Keyboard, Piano, Violin. Contains carnatic music standard notation, text of the composition, western staff notation score. Select 15 kritis of Maharaja Swati Tirunal, suited to instrumental music have been presented in western staff Notation. These compositions are best suited for playing on Keyboard, Piano, Violin. Contains carnatic music standard notation, text of the composition, western staff notation score. The 5 Ghana raga Panchartna kritis of Tygaraja, have been presented in western staff Notation. These compositions can be best suited for playing on Keyboard, Piano, Violin. Contains carnatic music standard notation, text of the composition, western staff notation score. Select 15 kritis of Purandaradasar, suited to instrumental music have been presented in western staff Notation. These compositions are best suited for playing on Keyboard, Piano, Violin. Contains carnatic music standard notation, text of the composition, western staff notation score. Select 15 kritis of Sangeetha kalanidhi G N Balasubramoniam, suited to instrumental music have been presented in western staff Notation. These compositions are best suited for playing on Keyboard, Piano, Violin. Contains carnatic music standard notation, text of the composition, western staff notation score. Select 15 kritis of Syama Sastri, suited to instrumental music have been presented in western staff Notation. These compositions are best suited for playing on Keyboard, Piano, Violin. Contains carnatic music standard notation, text of the composition, western staff notation score. This book is intended as a primer for understanding the system of western music prevailing in western countries. This book deals extensively with the intention of making it understandable to the layman as well as the students. The interesting aspect of the book is the comparative musicological aspects with the indian system of music. Video lessons on carnatic music for learning flute, Veena, Violin, Vocal lessons, keyboard,piano etc.